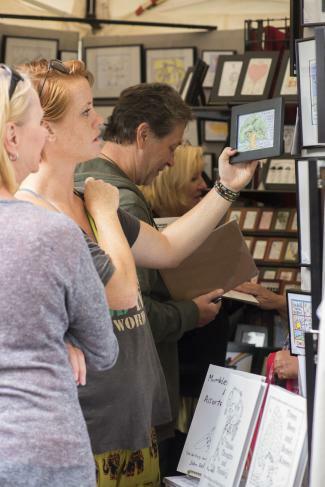 Nearly 200 artists and crafters will display works in a variety of mediums September 9-10 at the 56th Brandywine Festival of the Arts, in the Josephine Gardens of Wilmington’s Brandywine Park. A mix of familiar faces and first-time exhibitors will display their paintings, jewelry, pottery, photography and other works at the juried show, recognized as one of the best in the mid-Atlantic region. Other festival features include live music by local performers, children’s activities and a wide selection of local food vendors. Claymont, Delaware painter Rick Phillips, founder of the Darley Art Center, will be the featured artist at this year’s festival. In addition to having his works for sale, examples of his finest works will be displayed prominently on the festival grounds. Phillips, who transitioned into fine art some 20 years ago from a career as an illustrator for advertising and marketing agencies, employs bold strokes and an understanding of light and color to create contemporary images reminiscent of the work of 19th-century Impressionists. While most festival participants are from Delaware, Pennsylvania, Maryland and New Jersey, the festival typically draws artists from at least a dozen states. California, Texas and Florida had representatives at the 2016 festival. With its music, children’s activities and food vendors, the festival offers visitors plenty of options to shop, eat, listen and relax. The festival, begun in 1961 as the Brandywine Arts Festival, a street fair in downtown Wilmington, has become a much-anticipated end of summer celebration, now held the weekend after Labor Day in Brandywine Park in Wilmington. 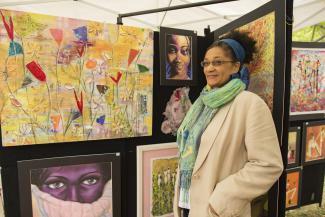 It was renamed the Brandywine Festival of the Arts in 2010, when Barry’s Events took over its operation. WSFS Bank is the presenting sponsor of the festival, named Best Art Show and Sale 2015 Editors’ Pick (upstate) by Delaware Today‘s Best of Delaware®. Media sponsors are The News Journal Media Group and 99.5 WJBR. A portion of the proceeds from the festival will be donated to Friends of Wilmington Parks. Hours are 10 a.m.-6 p.m. on Saturday, Sept. 9, and 10 a.m.-4 p.m. on Sunday, Sept. 10. Admission is $5; children under 12 accompanied by an adult are admitted free. Brandywine Park is pet-friendly. Remote parking with free shuttle bus service will be available from Baynard Stadium, Salesianum School and Papastavros Associates at 1701 Augustine Cut-Off. For more information, including a schedule of performing musicians, see www.brandywinearts.com or visit Brandywine Festival of the Arts on Facebook.